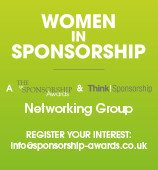 How to win a Sponsorship Award? The frenetic activity that goes into rounding up entries, judging winners and staging the UK Sponsorship Awards is about to begin. During this period, a number of companies which didn't win or get nominated contact us and ask why. So we decided it would make sense to try and give some broad insights into what it takes to win a Sponsorship Award. This is not a guarantee of success – so don't sue us. But it should at least help focus your mind as you starting drafting your entry. It's worth starting out by saying that, for the most part, the sponsorships which win or get nominated do so because they are the best. Look down this year's list of luminaries and you'll see a diverse range of big and small brands from a variety of industrial categories. These companies are marketing-led organisations which understand brand communications implicitly. So it is not unreasonable to suppose they might be best in class – particularly after their entries have been scrutinised by judges from all sides of the sponsorship business. It sounds obvious – but the judges can only make their decision based on what you have supplied them. As industry professionals, we all walk into the judging room knowing a reasonable amount about some of the more high-profile entries we have received. But it doesn't matter how good or ground-breaking your sponsorship is, you won't win if you don't get that point across in the entry. There's a good reason for this. Many of our entries are not known to the judges in detail. So to bring pre-judgments into the process would create an un-level playing field and distort the judging. The only way for any industry awards to be completely fair is to stick to the story that is told within the entry form. The Award rules stipulate that entries should be 1,200 words. There's a reason for this. The judges have to read hundreds of entries. There simply isn't time to read a book-length report on every single one. Because the judges are, on the whole, nice people they don't reject longer entries out of hand (so don't panic if you have written 1,202 words). Just keep in mind the phrase: ‘Less is more’. By the same token, try and tell the story in clear and simple English. You are not writing an academic treatise designed to baffle and confuse. You are trying to help the judges get to the heart of your story quickly. One thousand words should be more than enough to do that. This is in the rules too. But it's worth re-stating. The judges want to see objectives, activation and results. They get excited by words like evaluation and research. You MIGHT make a shortlist if you are weak on ONE of these points but you almost certainly won't win. Every year without fail, the judges will lament that fact that Entry A would have won if it had spelt out its objectives clearly while Entry B can't be on the shortlist because it hasn't bothered to put down any results. Generating £3 million of media value will not win you an Award if your objective was to make staff happier. Having a fantastically-creative implementation strategy will not win an Award if you don't say what it delivered. Okay. We've all been there. Time is tight, there are many jobs to do and suddenly there's the UK Sponsorship Award entry to write. So the temptation is to take an internal presentation and rebadge it as an entry for the Awards. The problem is that the judges can tell. This isn't to say that the material within such documents can't form the basis of an entry but you need to the entry and ensure it is ticking the boxes outlined above. If a campaign costs £50,000 and generates £20 million in media value then the judges will be suspicious – unless you can provide them with some attribution. As a general observation, everyone makes big claims on media value and audience numbers (e.g. we reached a cumulative audience of 23 billion with our sponsored three-legged race) so this is rarely a differentiator unless it is a) amazing b) backed by cast-iron research. Instead, winning awards tend to have a mix of quantitative and qualitative results (sourced) and one or two really compelling observations. For example, "sales went up by X% as a direct result our sponsorship" or "we generated £X million in contracts through our lion-taming corporate hospitality day". If the sponsorship is about less definable brand-based criteria then it helps to provide some context. For example, "28% of people said they liked us more and as a direct result, we got new distribution in 52 retail outlets." Or, "younger people said our brand was more dynamic and modern so that has allowed us join forces on a new promotional partnership with funky brand X." The point is that everyone will claim that their brand is more loved now than it was before – otherwise why would they bother entering the Awards? So you have to think of some way of making your claim stand out from rivals. There are three issues here. Firstly, some people put their entry in the wrong category. B2B for example is badly misunderstood. So, before entering, it is worth talking it over with colleagues so that you all really know what it means. It is not the same as Brand or Social Purpose– though it overlaps slightly with both. It is about areas like employee engagement and influencing opinion-formers. Continuity also causes problems – because it is not simply about being around for a long time. It's about showing how the sponsorship has evolved year-by-year – staying relevant rather than becoming a forgettable background fixture. Secondly, some entries don't fully cover the ground. For example, Social Purpose (Charity/Community) causes some confusion because it needs to demonstrate how the sponsorship worked both for the brand involved and the beneficiary organisation. This year's winner Halifax and The Big Lunch explained clearly how both they benefited from the partnership. But some entries barely make mention of the reasons why the commercial brand got involved at all. Finally, some companies try to double their chances by entering two categories. But they don't adapt their entry accordingly. If you simply change the category name at the top of the sheet then you won't win – because you can't have addressed the specific concerns of both categories. This doesn't mean you have to rewrite everything from scratch – just that you need to add a short category-appropriate introduction upfront and read though to make sure you've talked up the sections that are relevant to each of your categories. Every Awards event is accused of favouring big companies – and ours is no different. The fact is that big companies will inevitably feature prominently because they activate their sponsorships across so many channels. Guinness is, incontrovertibly, a good sponsor. So are npower and Vodafone. If we didn't acknowledge that fact it would look silly. But that doesn't not mean small companies can't win. For a start, there are two categories which are clearly aimed at them – Smaller Budget and First Time. Then there are areas like Arts, Social Purpose and Best Use of PR where the price differentials are not as great as in – for example – Sport and Media. But most important is the fact that the judges bend over backwards to be fair. If you spend £20m, you will need to prove it is money well spent. Over the years, many big brands have been savaged for not showing the commercial sense of their investment. By the same token, the judges know that smaller companies won't execute their sponsorship across as many channels as big companies and are probably not going to spend as much on areas like research. But recent winners like Coca-Cola, Jeep and Morrisons show that there is nothing to stop smaller brands from winning. Examples include: Papa John's, Castello and Cono Sur. The real reason small companies sometimes fall down is usually the same as for big companies – because they haven't ticked all the boxes on their entry form. If you can explain in 1,200 words the points raised in heading three, then you give yourself the best possible chance. So there it is – the inside track on The UK Sponsorship Awards. And why should you want one on your mantlepiece? Well, the simple fact is that the Awards are the standard by which the UK industry as a whole is judged. Whether you win or are on the shortlist, you can be secure in the knowledge that your sponsorship has been judged objectively by a wide range of experts in the field. That's useful for a number of reasons. Firstly, because it's good corporate practice to recognise and reward the achievement of the individuals who pour their energies into making these sponsorships happen. Secondly, because a successful sponsorship is nice to put on the CV (for individuals and agencies). Thirdly, because you can go back to the board and show them that it's not just you who thinks the money has been well-spent. And finally, because a vibrant Awards scheme says something about the professionalism of the industry as a whole. Whether you win or not, by entering you are contributing to the advancement of the sector – either by pushing back the boundaries of creativity or encouraging best practice. That in turn brings the best new talent into the business and drives continued investment. So to sign off, the Awards team would just like to say thanks for entering and we look forward to spending many long hours picking over your entries.